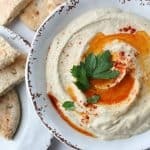 An easy recipe for homemade hummus that’s extra creamy without adding extra oil. Add the beans to a food processor with 1/2 cup tahini, 2 – 4 tbs lemon juice based on taste, 2 tbs oil, salt and start to blend, slowly adding in additional water until the hummus it the consistency you like. Adjust water and salt until desired flavor and texture. Serve with pita and vegetables.